Call it a case of consumer preference mirroring theory. Or in this instance, a split-screen view on the modern screen-splitting media consumer. 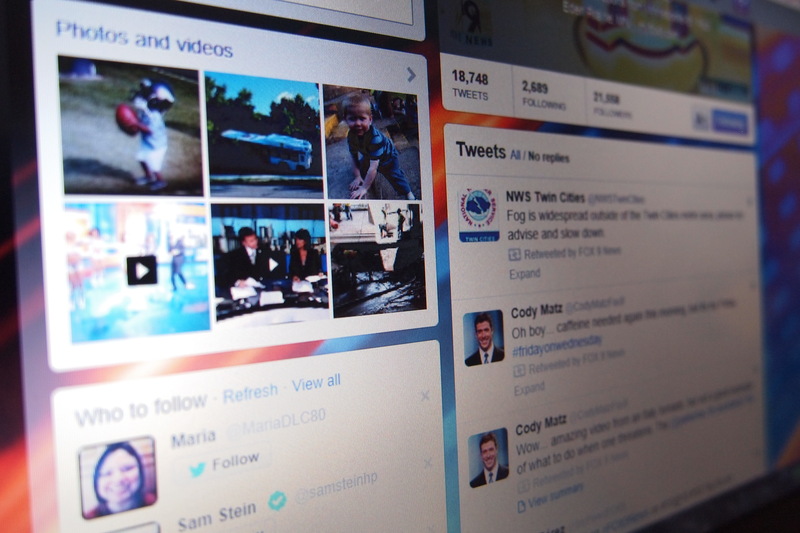 The latest research is out on how social media consumers engage with local legacy media outlets and it offers an instructive lesson in well-established communication theory and how local TV stations can use it to their advantage. 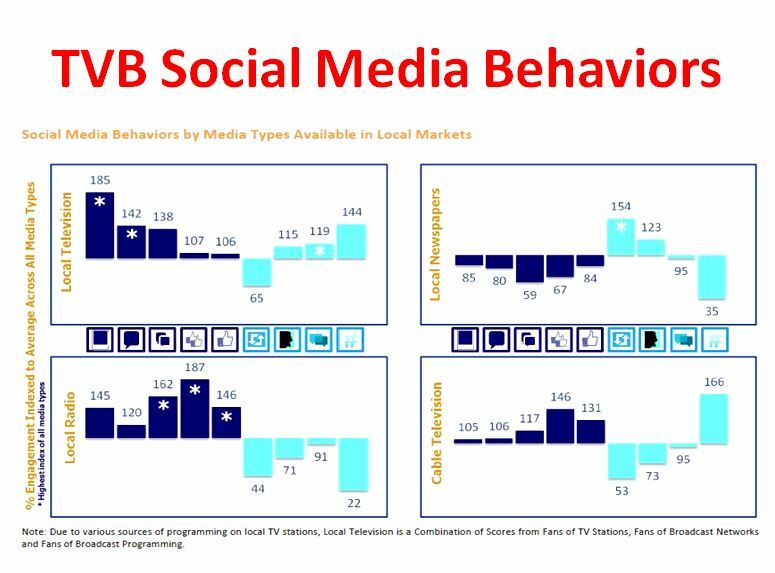 The research conducted by TVB in collaboration with Colligent gives important insights into what they call “Cultural Currency.” The study analyzed 167 million Facebook and Twitter users and how they engaged with local TV stations, newspapers and radio stations throughout the United States. The results show local television stations dominate with consumers wanting to share video and pictures in addition to those who frequently comment on Facebook and maintain conversations on Twitter. (Figure 1) Newspapers lead with those who retweet posts. Local radio stations attract the most frequent Facebook “likes” and multiple comments. Nearly all of these results are predictive based upon communication Uses and Gratifications Theory. In its simplest form, U&G holds that people use certain media based upon their psychological needs. Elihu Katz developed a U&G typology where people read books to create a sense of inner self, television and film provide pleasure, whereas newspapers provide self confidence and stability. Likewise, Louis Leung has found a significant connection to social media by people who feel the need for recognition and empowerment. Leung’s research reveals that the more a user’s recognition needs are met through social media, the more empowered they feel and therefore are more likely to contribute content and share content with their friends. My own research of Fox 9 News viewers in Minneapolis found very similar social media motivations that are consistent with U&G theory. 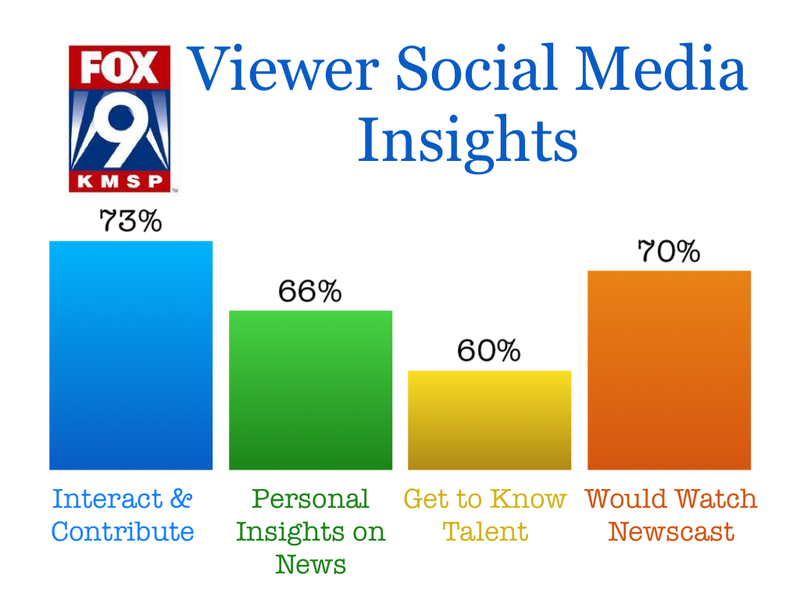 A survey of 1100 viewers indicated a strong desire to connect and contribute to conversations generated by Fox 9 newscasts and its personalities. (Figure 2) In fact, nearly 4 out of every 5 viewers expressed the desire to interact with and contribute to Fox 9 through social media. Likewise, 66% wanted personal insights from reporters and on-air talent on what goes on behind the headlines. Perhaps not surprisingly, 60% indicated they wanted to get to know more about the on-air personalities more than what they see on television. But the most tangible finding revealed 70% of viewers would likely watch a Fox 9 newscast based upon an intriguing social media post. 2. Conversations and the recognition that comes through contributing comments, pictures and video. 3. Unique and exclusive content. Combine these insights with the new user-based research from TVB and we can create a new U&G model to illustrate predictive social media behavior. (Figure 3) With social media (Facebook & Twitter) at the center of the model, one sees the strong U&G ties to individual local media channels. Television, with its strengths in providing pleasure, engaging news personalities, and credible images is a natural draw for Facebook users who seek recognition through contributing pictures and video. Additionally, there is a lure to connect with the personalities who come into their living rooms on a daily basis. Connecting with them creates a sense of fulfillment and self-importance. Newspapers, with their vast journalistic resources become a hub of credible up-to-date information. The immediacy of this information aligns perfectly with Twitter where consumers turn to learn about events happening at that very moment. Retweeting that information from a newspaper tells the consumer’s followers and friends that they are “in the know” and provides the sense self confidence that they are in tune with what’s happening in the world around them. The accessibility of local radio, especially stations with personality-driven talk formats and multiple interactive topics is a natural draw for multiple Facebook likes and comments, again based upon the need for recognition and self-importance. The model offers lessons, especially for local television stations. 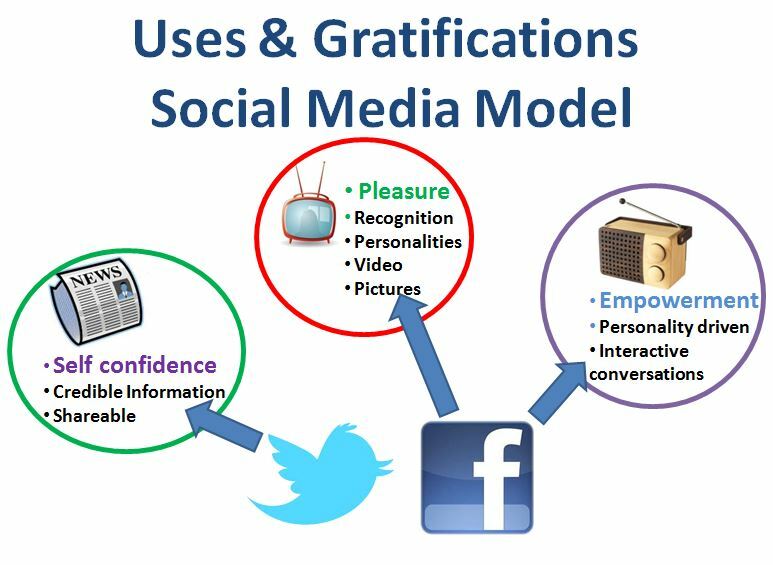 As people look for pleasure, connections, and recognition, U&G theory holds that television stations are in a unique position to provide it through social media. The latest research from TVB supports it.